Shira.net users may recognize Tahseen's name as the person who contributed 70 Arabic song translations to my web site. If you have ever used one of these translations, then he has touched you, too. This obituary originally appeared in the Lawrence Journal-World newspaper in Lawrence, Kansas on October 17, 2006. Services for Mohammed Tahseen Beq Alkoudsi, 69, Lawrence, are pending and will be announced by Warren-McElwain Mortuary. Burial was at 2 p.m. Monday in Memorial Park Cemetery in Lawrence, and a seven-day Islamic Prayer Service began in Damascus, Syria. 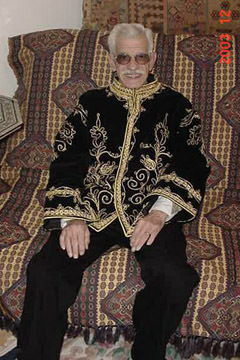 Mr. Alkoudsi died Sunday, Oct. 15, 2006, at his home. He was born Aug. 2, 1937, in Damascus, the son of Mohye E’din Beq Alkoudsi and Wojihah Khanum El-Eid. He received a Bachelor of Arts in Business from the University of Damascus and a Master of Science in economics from Kansas University. He lived in Lawrence since 1962 and received his U.S. citizenship in 1974. Mr. Alkoudsi was an economist and financial analyst for the Federal Home Loan Bank of San Francisco from 1967 to 1975. He traveled to Yemen with the United Nations to install the first computer in Yemen, where he trained more than 100 personnel from 1975 to 1979. He then worked with the United Nations Educational Scientific & Cultural Organization as an informatics specialist in the Middle East in Jordan, Paris and Egypt until he retired in 1995. He was co-founder of Cartouche and was known internationally for his translation of Arabic songs to English. He married Kathleen White on Aug. 17, 1968, in Lawrence. She survives, of the home. Other survivors include a brother, Ahmed Bassam Alkoudsi, Damascus; and four sisters, Omayma Alkoudsi, Rabiyaa Alkoudsi, Aisha Alkoudsi and Nahidah Alkoudsi, all of Damascus. The family suggests memorials to the ECKAN food pantry or LINK, sent in care of the mortuary. To me, Tahseen was so much more than a contributor to my web site. Even though we lived far apart, I saw Tahseen and Kathe several times over the years. I always appreciated their warmth and generosity. I first "met" Tahseen online back in 1997 on the med-dance list, where he periodically posted messages. I knew he was in Lawrence, Kansas, so when a business trip arose requiring me to travel to the Kansas City area, I emailed him to say I'd be in the neighborhood. He and Kathe came to Kansas City for an evening get-together at Tasso's restaurant, and they invited several local dancers to join us. I saw them on follow-up visits to Kansas City. They vended at Rakkasah for several years, and it was always a pleasure to greet them there in the anteroom off to the left of the main stage. I also enjoyed encountering them in Egypt at the Ahlan wa Sahlan festival.